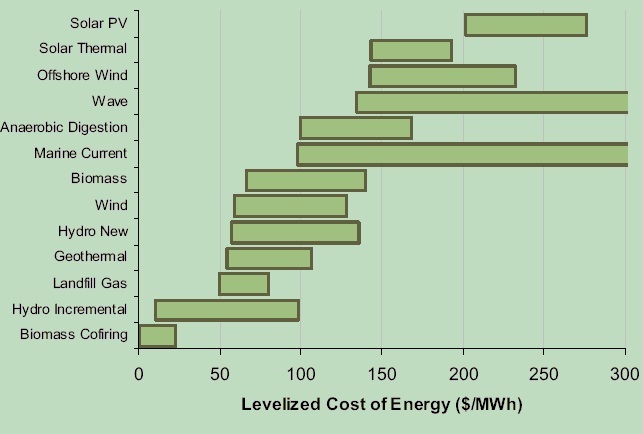 Renewable Energy Blog: What is the Cost of Renewable Energy? What is the cost of renewable energy? This is the question that politicians should be asking themselves before they compose their energy policy. Obviously there are a lot of variables that influence the answer here. Technologies are developing all the time so efficiency is likely to improve over time - and thus the cost will fall. In wind energy the costs are being driven down by size, the latest and largest wind mill to date was erected in August 2012 in Denmark, a Siemens giant at 6 MW and 196 meters height. Subsidies, tax exemptions as well as unit compensation is likely to change over time, as politicians change policies. Unit costs are influenced by the size of the investment, but also by the life time of the investment as well as the operation and maintenance costs. In some cases there are fuel costs that can change over time as demand and supply can change over the life time of the investment, in other cases (wind, solar, hydro and wave) the "fuel" generally is free, but can vary in quality and quantity. The chart dates back from 2009 and is based on a California context. Interesting to see that solar comes out as a very expensive type of energy. Surely the Solar PV industry shakeout has changed this picture a bit. But is it enough to defend the big move Germany has made into solar? Resulting in a record 40% supply of national energy production on one sunny day in May 2012. 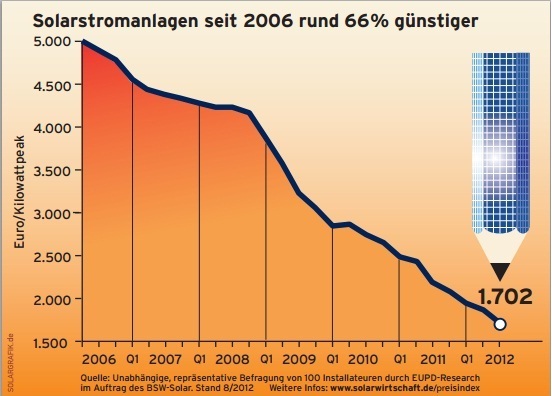 Installation price of solar PV plants in Germany have fallen 50% since 2009 after the industry shakeout. Credit: Bundesverband Solarwirtchaft. This is surely an interesting subject that I hope to revisit soon, so we can get more facts on the table.